The creatures of Glacier National Park deal with winter in many different ways. While the bears are hibernating and the goats are foraging on south facing cliffs, the diminutive pika is nestled in his den munching on the piles of grasses he gathered during the summer. I also like to think that he uses some of those grasses to make decorative wreaths, goes caroling at his neighbor's den and swaps gifts of nuts and berries with his family. 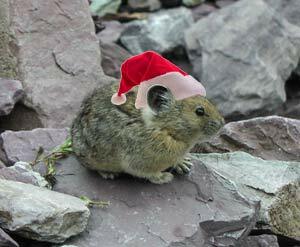 Whether you are hibernating like a bear or partying like a pika, the chalet staff would like to wish you a Merry Christmas and a happy holiday season! Here in our office we are planning a short break over the holidays. The office will be closed from December 24 through New Years. We will be back to help you on Monday, January 5. We will be closing our office for the week of November 23 through November 30 so that our staff can spend time with their family and friends over the Thanksgiving holiday. We hope you get a chance to enjoy extra time with your loved ones as well. If you have sent your reservation deposit and it has not yet been processed, don't worry. All reservations will be secure until we get a chance to catch up on business after the holiday. We will not be able to answer the phone during the Thanksgiving week, if you have business to attend to please send an E-mail. We will reply the first opportunity we have. This year I have been reminded of how many kind and generous people there are visiting the backcountry of Glacier Park. This Thanksgiving I would like to say a special thanks to the wonderful people I have met at the chalets and on the trails. Thanks to everyone for your patience as we work through our initial reservations requests. We are thrilled with how eager everyone is to come visit us in the summer. We guarantee we will process every one of your reservation requests. If you are still waiting to hear back from an online request, we are sorry for the delay. Our staff is giving each of the hundreds of requests the personal attention it needs to make sure your reservations are correct. We may not be able to respond as quickly as the big hotel chains, but the chalets are special places and we are trying to give everyone the best vacation possible. Some popular dates in the summer have already sold out. We will keep you informed through our online availability calendar. If you have flexibility and alternate dates, that makes it easier to get you a room. Please see our reservations page for details or to place an online reservation request. Our first week accepting reservations is typically very busy. Thank you for your patience if our phones are busy or if you do not hear back from your online request right away. Due to the backlog of online requests our online availability calendar cannot keep up. Any availability displayed there is not guaranteed. We now have our operating dates for the 2009 season. Granite Park Chalet will be open June 30 through September 7. If you are planning a visit to Sperry Chalet as well, the Sperry Chalet will be open July 8 through September 9. We begin accepting reservations on Monday, October 27. We are looking forward to helping you plan your visit to the chalets. We will begin accepting reservations for the 2009 season beginning on October 27. Reservations can be made through our toll free phone line or from this web site. Any reservation requests sent earlier than October 27 will be discarded. We are still working on the opening and closing dates for 2009. As soon as we know, we will publish the dates right here. Granite Park Chalet and Sperry Chalet are now closed for the winter. On behalf of our staff, the crews up at the chalets and the office team down below, I would like to say a heart felt "Thank You" to all of our guests. We are thrilled that you shared part of your vacation with us and helped us enjoy a fantastic summer. The reservation office will be closed for several weeks while we start getting ready for 2009. Important announcements and information about 2009 reservations and operating dates will be coming soon. Watch this space. A reminder to all the ambitious hikers visiting us next week, the last day for the Going-to-the-Sun Road shuttle is Labor Day, September 1. After that your best choice for visiting the chalet is to hike the same trail back to your vehicle that you came in on. There will be no public transportation available from one trailhead to another. Granite Park Chalet is closing for the season on September 6. Day hikers can still purchase bottled water and snacks up through Saturday the 6th. No services will be available Sunday the 7th. The weather forecast for this next week has both rainy days and sunny days in it. Be ready for anything while hiking. Be sure to stay warm and dry. Hiking in Glacier Park this time of year can still surprise me. After a summer full of hot and dry weather, finding a cool comfortable hike on the Highline Trail is a pleasant surprise. But the surprise is not so fun if you find yourself on the continental divide unprepared for sudden cold or wet conditions. If you are visiting us at Granite Park Chalet in the next couple weeks, be prepared for cooler and perhaps wetter weather. Bring some warm clothes for when the hiking is over, sweaters and jackets are a good idea. A warm hat and gloves won't take up too much space in your pack and squeeze in some long underwear too, if you have the room. You might not need them, but better safe than sorry. Always pack your rain gear too. I got caught in a rainstorm while hiking last week, but I had my waterproof layer and stayed warm and dry. Hiking in the rain turned out to be the most fun I have had on the trail in a long time. 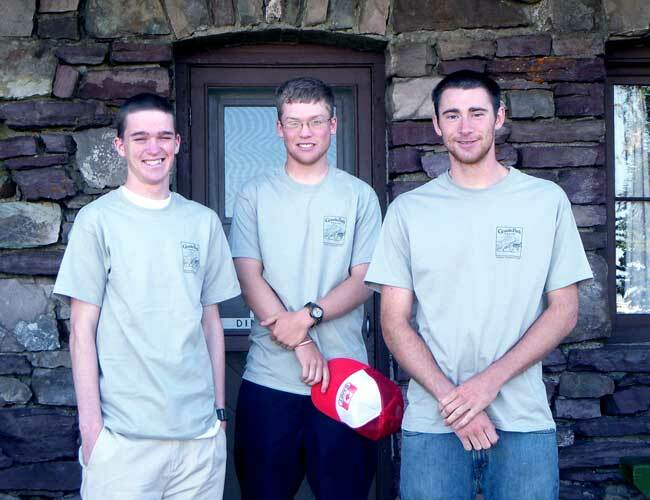 Being at Granite Park Chalet is enough to bring out a smile in most people, but Lars, Adam, and Johnny are sporting their grins because they just got their new Granite Park Chalet tee shirts. You could be wearing a grin, and a tee shirt, just like theirs after a quick trip to our online gift shop. Grizzlygoat.com is the brand new, official, online gift shop for Granite Park Chalet. There are shirts available there now, and soon there will be even more gifts and clothing to help you show off your favorite backcountry chalet. The National Park Service opened the Highline Trail from Logan Pass to Granite Park Chalet on Friday, July 18. This is certainly good news for all the hikers anxiously waiting to enjoy this beautiful route; but be advised, open is not the same as clear and safe. Expect to find snow hazards along the Highline Trail. Hazards can include things like snow bridges that can collapse below hikers, especially over streams and water crossings. There can also be sharp drops and large steps where snowpack melts away from the trail. Some of these steps can be up to 4 to 8 feet in size. Slipping and falling in these places can be just as dangerous as falling off a roof, so be careful. As the snow melts this year, expect the hazards to shift and change. Until the snow is completely melted we cannot predict exactly what trail conditions will be like. Our recommendation is to be prepared for a variety of snow and ice conditions. Sturdy and waterproof boots are a must. Lug soles or extra traction devices are a good idea. Trekking poles are recommended. If you have ice axes or crampons it can't hurt to take them. Be safe out there. If hiking like this is outside your comfort level the loop trail is still the best bet for getting to and from Granite Park Chalet. What an amazing amount of snow we are enjoying in the high country this year. When you visit be prepared to unleash your inner child with snowmen, sledding and sliding and possibly a snowball fight. The Highline Trail currently remains closed, but in our conversations with the park trails department they may decide to open it as early as this Friday, the 18th. Even if this trail opens, do not expect it to be snow free and easy walking. In fact there are sure to be many dangerous spots along the way. Beware of traversing steep snowfields, dangerous snow bridges over streams and water crossings, and large drops or gaps between the trail and the snowpack. Hike at your own risk. The best route into Granite Park Chalet is still the Loop Trail. We managed to get our supply mules up this trial for the first time this week, so the trail is reasonably clear and easy to follow. We recommend bringing waterproof boots and extra dry socks with you when you visit the chalet. Hiking poles can also help you keep your balance and negotiate some of the tricky spots on the trail. For the most up to date information on trail conditions, check the park trail status reports online. You can also get this information from any visitor center in the park. We are excited to welcome you to another fun summer at Granite Park Chalet. The big news at Granite Park Chalet is the amazing amount of snow in the high country this spring. You can see it for yourself at Logan Pass starting July 2. We want to thank the Park road crews for doing such an incredible job of clearing Going-to-the-Sun Road this year. Right now Granite Park Chalet is only accessible from the loop trail. Expect to find snow on the upper mile of this trail. It is melting fast, but our best guess is there will still be snow around the chalet up through July 15. The snow is not particularly difficult to walk on. It will be firm in the morning hours and perhaps a little icy. In the afternoon it softens up quite a bit and you will likely sink in a few inches in spots. It is strongly recommended that you have sturdy, waterproof footwear, and bring extra dry socks. The Highline trail is not passable. We have no forecasts or predictions for when this trail will be cleared and safe for travel. Just like you, we are watching the park trail status reports online. Please don't let the snow discourage you from visiting Granite Park Chalet. This is a fantastic opportunity to see the chalet and the backcountry of Glacier in a way that very few people ever experience. With a little caution and preparation, your snowy visit could turn into a once in a lifetime magical experience. Going-to-the-Sun Road is open to Big Bend as of noon on Saturday, June 28. Access into the alpine section will only be available from 7 a.m. until 9 p.m. Outside these hours, west side vehicle travel will terminate at Avalanche. Park road crews, assisted by park trail crews, will be working throughout the weekend to prepare for the safe opening of the entire road. There will be no hiker/biker access beyond Big Bend for several days. On the east side, there will be a hiker/biker closure at "No Stump Point"
which is just beyond Siyeh Bend. "If the weather continues to hold, and if there are no unanticipated obstacles, we should be able to open the entire road for at least part of the holiday weekend." said Superintendent Chas Cartwright. For current road condition information, visit the park's road status Website http://www.nps.gov/applications/glac/roadstatus/roadstatus.cfm. Current road conditions are also available by calling 511, the Montana Department of Transportation Traveler Information System. If your phone does not support 511, call 1-800-226-7623. Both numbers are toll-free. Select "Glacier Park Tourist Information" from the main menu to hear Glacier's road report. This year is the Going-to-the-Sun Roads 75th anniversary! It was July 15, 1933 that Glacier National Park formally opened the road across Logan Pass. Lots of us here in the park will be commemorating and celebrating this engineering marvel this summer. Be sure to take a some time to enjoy this incredible road when you visit the park this year. There is even a free shuttle system so you don't have to do the driving. If you have a little extra time during your vacation I want to recommend a visit to the Hockaday Museum of Art in Kalispell, (http://www.hockadaymuseum.org/) this summer they are hosting an exhibition celebrating the 75th anniversary of Going-to-the-Sun Road. The Sun Road restoration project will still be ongoing this year. The park assures us that the entire length of the road will be open to vehicle traffic, but expect delays in the construction zones. Of course the big question on many peoples minds is: when will the road be open to Logan Pass? The unfortunate answer is: we don't know. What we do know is that you can keep tabs on the road status online. You can see how much of the road is open. You can check on the location of the plows. And my favorite is the plowing photos and video. After you arrive in Glacier you can always get up to date road information from any park visitor center. I hope you have a spectacular vacation. Good news hungry hikers, our pre-order retail menu is now available! Let us help lighten the load in your backpack by having your food waiting for you when you arrive at Granite Park Chalet. Get all the details and place your order here. Friendly reminder, administrative fees are coming soon. As we get closer to summer and you get your travel plans ready, we want to remind you that starting June 1st there will be a $10.00 fee for all reservation changes or cancellations. The month of May is your last opportunity to change or cancel your reservation without penalty. Please call the reservation office if you have any questions. Spring plowing of Going to the Sun road is getting underway this first week in April, (NPS Press Release). Along with longer days and emerging bears, this is enough to get me excited for summer hiking in the park. The park service is currently planning to have the entire Going to the Sun Road open to vehicular traffic on Friday, June 13. We can follow the progress of the snowplows online. Looking forward to happy trails. We have added a new page to our website. The FAQ page with answers to all the most common questions. If you are curious about anything to do with visiting the chalet; trails, food, reservations or restrooms, check the FAQ list for the answer. The superintendent of Glacier National Park, Mick Holm, has retired this month. We would like to say a heart felt "Thank You" for all the effort Mr. Holm has put into caring for our beautiful park. The Department of the Interior has also recognized his contribution with a meritorious service award. Congratulations on your retirement Mick.